W I N T E R 2 0 1 4 | W E S T W O R L D A L B E R T A 27 The Group of Eight: Ron Deshayes and extended family VISITED: May 2014. It was our rst time as a family. We'd gone previously with our son and daughter, but that was 32 years ago. DIGS: Accommodation for eight was not all that easy to nd! We stayed at the Best Western, a block-and- a-half from the park. 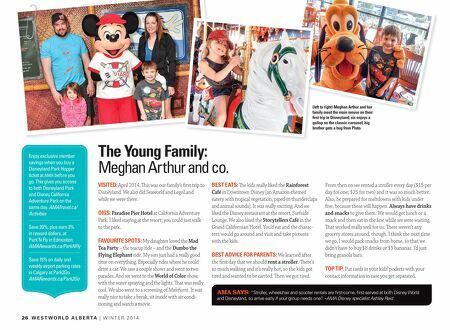 FAVOURITE SPOTS: ere wasn't a single ride at Disneyland we missed. California Screamin', the big roller coaster, was a favourite. Others were Space Mountain and the Twilight Zone Tower of Terror – the one that goes up and down in an elevator shaft. And the World of Color water and light show – everyone really loved that, from grandpa and grandma to the grandkids. BEST EATS: Wine Country Trattoria at Disney California Adventure Park. It's inspired by Napa Valley wine country, so it has a vineyard look to it. It had been recommended to me by someone here in Calgary, who said if you want healthy food, try this one. And it turned out to be very good. BEST MEMORY: I think for us it was just seeing the kids enjoy themselves so much. We took in Disney and Universal Studios, went to an Angels baseball game and had a day at the beach. It was a pretty jam-packed seven days. e kids were real troopers. ey just kept going and going. At the end, I asked one of the grandkids what the best part of the whole trip was. And it was interesting, he said the day at the beach. I said, you're kidding! And he said no, he just really loved the beach. Sometimes it's the sim- plest things – it's not always about what you spend. TOP TIP: Buy the Park Hopper pass, which allows you into both Disneyland Park and Disney Califor- nia Adventure Park. at way, you're able to go from one park to the other at any given time during the day. It doesn't take a lot to go back and forth – around 10 or 15 minutes. It's much more accessible than I thought. W Stay right next to the magic! Save up to 20% at Best Western hotels. AMARewards.ca/ BestWestern Rent a car and get off the resort – go to the mall, the beach, an Angels game. Save up to 20% at Hertz. AMARewards.ca/Hertz AMA SAYS: "If you need a bite on the run, try the Earl of Sandwich – a cute quick-serve place. I always order the turkey sandwich: it's like Thanksgiving in a bun!" 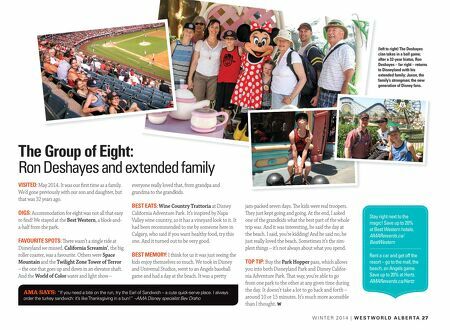 –AMA Disney specialist Bev Draho (left to right) The Deshayes clan takes in a ball game; after a 32-year hiatus, Ron Deshayes – far right – returns to Disneyland with his extended family; Jaxon, the family's strongman; the new generation of Disney fans.